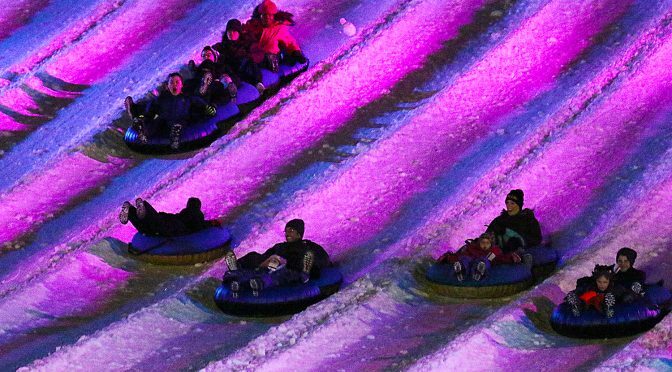 Tannersville, PA – Just in time for the Christmas holidays, Camelback Resort in Pennsylvania’s Pocono Mountains officially premiered two new winter-season components in its ongoing expansion as a complete four-season destination. 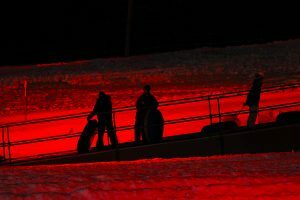 Not content with being the largest snowtubing operation in the United States, Camelback –which has been voted the #1 resort in Pennsylvania four years in a row – replaced its white halogen lamps with an after-dark LED light show and music to enhance guests’ speedy, shriek-filled descent down all 42 lanes. In addition, alongside the park is the comfortable new Base Camp 1 Lodge, where customers can relax between runs, purchase supplies, and grab a variety of beverages and snacks, including hot waffles. First Tracks!! 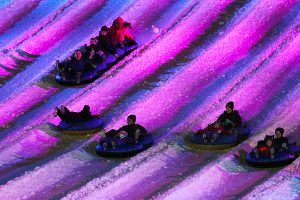 Online enjoyed a fun-filled one-day tour of Camelback’s winter offerings, arriving in the early evening for the new Galactic Snowtubing experience, followed by a delectable buffet dinner at Camelback Lodge’s Hemispheres Restaurant. We then checked into our well-appointed suite for the evening. All Lodge accommodations include access to the extensive Aquatopia indoor waterpark (a perfect way to kick off the morning) as well as lift tickets for skiing, which we enjoyed that afternoon under pleasant temps and sunny skies. We closed the visit with delicious burgers and craft beers at the slopeside Trails End Pub and Grille. In short, a perfect option for families in the New York City/New Jersey region seeking a full-service winter getaway within less than a 90-minute drive.